Hei, ensimmäinen pakkasyö, auts mökkikukat ovat tainneet paleltua. Nyt tulee neljän kortin pläjäys, erilaisia, mutta jotain samaa löytyy! Hi, first frosty night, I'm afraid that my flowers at the cottage are damaged. Today I'll show four cards for different occasions, but something similar with them. Quite different? 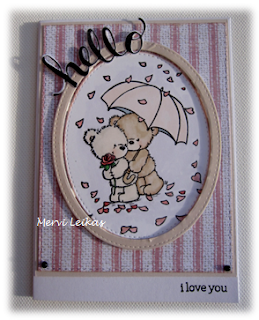 I used Hero Arts hello stamp&cut set, I bought it from the Craft Camp. Goodness me Mervi, frosts already, hopefully a bit longer till the reach us. A lovely collection of cards. Very different indeed! 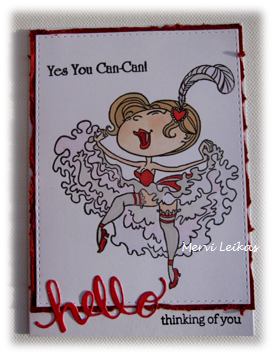 I really like that cancan dancing woman, such a fun design with a great matching sentiment. 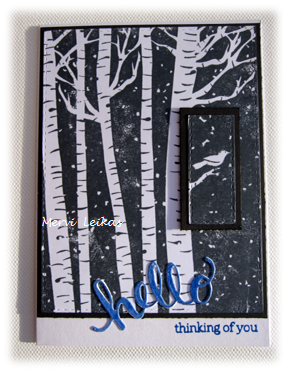 I also love the tree scene and how you cut out the rectangle with bird and popped it, a great design effect. All great cards, but I love the little bird in the frame on the birch tree card. Voi miten ihania - tuo lumiukko sinisessä värimaailmoineen upea ja dramaattiset koivut saavat pilkkeen silmäkulmaan koholle asetetusta linnusta; upea yksityiskohta... kaikissa "jotain jännää!" 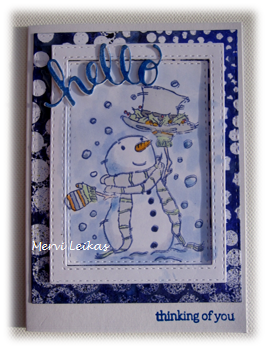 What a fantastic collection of cards.They're all so lovely and beautifully designed.Thanks for joining us at Crafty Sentiments.Hope to see you again next week. Follow me/ seuraa minua ! Kissa ja kukka ja perhonenkin, peiliä seinälle. 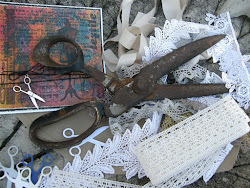 Leanne C Harris's Blog. A Brush With A Stamper. Mid month reminder at Penny Black and More Challenges for this months challenge - Springtime! Irtipäästäminen ei ole maailman loppu; se on uusi alku. Please consider turning off word verification! Kiitos vierailustasi, jätä terveiset ! Thanks for your visit and I really appreciate if you leave me a comment, so I can visit you back!